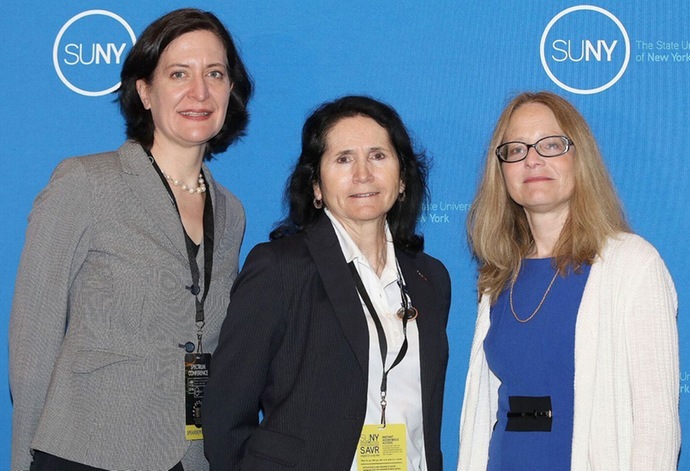 BUFFALO, N.Y. -- Senior Associate Athletic Director for Sports Administration and Senior Woman Administrator Kathy Twist was one of a number of panelists speaking at the annual SPECTRUM Conference, which was held by The State University of New York from June 19-20. SPECTRUM is the nation's largest educational conference devoted to preventing and responding to sexual and interpersonal violence against members of the LGBTQI+ community. The conference featured national-level keynotes and concurrent speakers and panelists, the opportunity to network with colleagues, and access to low-cost, repeatable, and implementable programs and solutions to reduce violence against LGBTQI+ students and community members. Twist joined fellow University at Buffalo employees, Sharon Nolan-Weiss, the ADA and Title IX Coordinator, and Helen Drew, an adjunct faculty member in the School of Law, who is an expert in sports law. In their session, which was titled "Diversity & Inclusion in Athletics: Legalities, Policies & Practicalities," they provided information and advice on legal requirements, policy formulation and implantation and best practices in the area of athletics. Topics of the session included the evolving application of Title IX to sexual violence, sexual harassments and sexual discrimination, as well as engaging the student-athlete population as role models and student leaders. "It is important for people to know that we value diversity and inclusion at the University at Buffalo," said Twist. "The collaboration of UB Athletics, the UB Law School and the UB Office of Equity, Diversity and Inclusion demonstrates our commitment to find the best practices and programs to stop the violence and discriminatory practices against the LGBTQI+ community." The University at Buffalo has been a leader in Diversity and Inclusions as it earned the NCAA and Minority Opportunities Athletic Association's 2018 Award for Diversity and Inclusion.